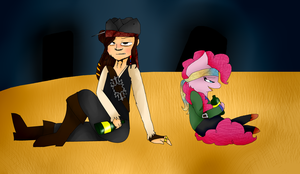 Welp, it looks like Pinkie went to the Tavern. I'm happy to hear that you liked it. "WHY IS THE RUM GONE???" Really nice work with the coloring! It looks so cute! How can she pirate if she's too drunk? Clearly, you've never heard of Jack Sparrow. I love this. It's adorable! Ponk pirates life for me! "Ahhhh... So good after all that cider..."
"Huh? What's wrong with my cider?" Looks like a bottle of maple syrup to me. Pinkie ROLEPLAYING!? And here I thought only Sunset play video games... Well, whadaya know, she's pinkie. Only Sunset? What about Rainbow and AJ in first EG movie? I don't remember they were playing any video games in EG. Maybe because Sunset is my favorite pony. Ah, yes.. I remember that. Fluttershy also played video games in EG Holiday Special comic. Actually I mess up with costume - I was hurry up and messed up with sleeves. Pinkie is just having some "fun" with what ever she's drinking.